​These dried wreaths, floral and herb, add beauty to the interior and exterior of your home. Hang them according to seasonal colors and designs, or enjoy them year around. These lovely dried flower and herb wreaths also make great gifts for weddings, anniversaries, birthdays, and so on. Hang them on an entry door, or any wall in your home to add texture, color, fragrance, and beauty to any room. Greet guests as they arrive with a pretty dried wreath, when you hang one on your exterior entrance doors. Spring and summer is a time for new beginnings, fresh flowers, and cheery, sunny days. ​These spring and summer dried wreaths are ideal for your entry doors, or the interior walls of your home or office. Multi colored larkspur, globe echinops, and assorted silk flowers are arranged around silk sunflowers. The contrast of spring colors and textures makes this arrangement a perfect touch for the interior during the spring and summer months. Grown and handcrafted in the USA upon order. Recommended for INDOOR USE ONLY. 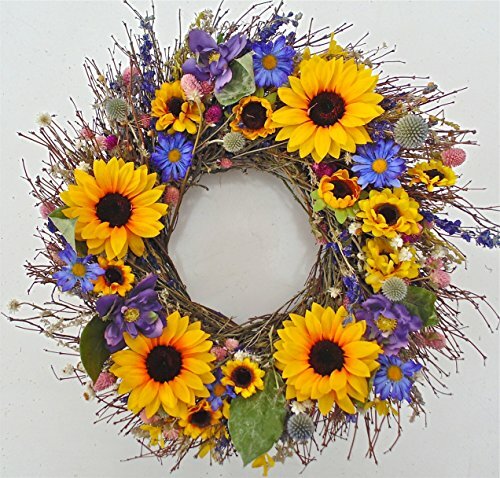 This wreath has natural dried flowers that can bleed color if exposed to outdoor elements. 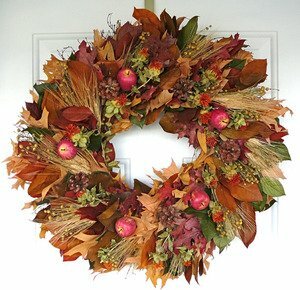 Fall leaves are full of color and beauty, and many of these dried wreaths featured below are, as well. 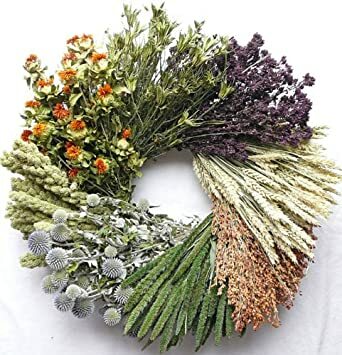 ​Bold autumn colors, rich aromas, and more, fill these fall or autumn dried flower and herb wreaths. Size 20-22" In Diameter Every effort is made to replicate the colors, textures and ingredients of the designs pictured. Due to Mother Nature's recent growing patterns, components may vary with the season. 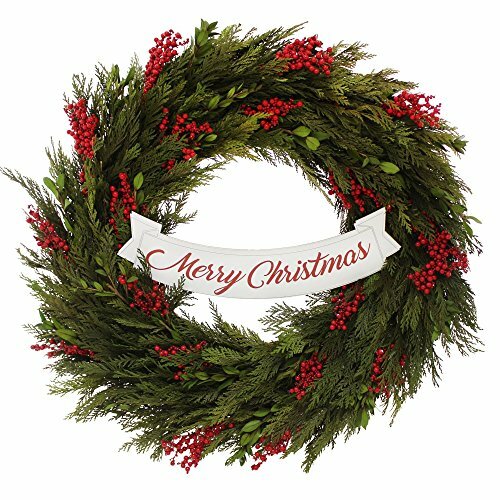 "Our wreaths are handmade with silks and American-grown natural products. Keep Out of Direct Sunlight or it will fade. Bring even more beauty to your winter and holiday decor with a pretty dried wreath that matches the season. Whether you choose a Christmas wreath, or a general winter dried wreath, your home will look festive and fabulous. ​Upon order being placed, floral elements are harvested by grower. PND air-dries all elements needed for wreath's creation and gather various materials necessary to assemble wreath. 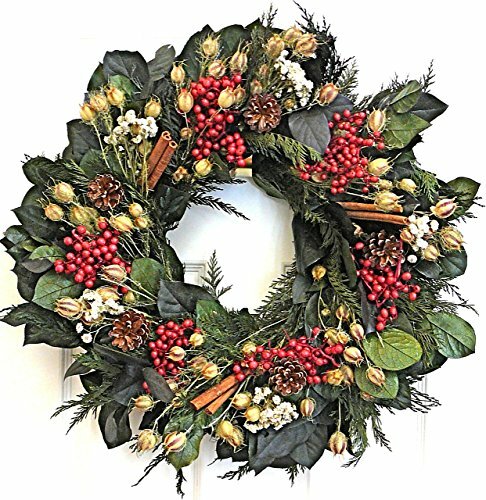 Once fresh floral items are dried to desired level (still plyable), wreath is created by first building the wreath's foundation (the greens). Accent elements are added and secured accordingly using either floral wire or adheisive. Filler elements are finally used to fill-in any visible gaps/holes in wreath's design. Handcrafted in the USA upon order on a textured bed of leafy green preserved salal. Perfect to use as a dried Christmas wreath or give as a holiday gift. Adorning the design are real red canella berries and bundles of seasonal cinnamon sticks. The salal is interwoven with all natural dried Nigella, Pearly Everlasting, and preserved Cedar. The contrast of color and texture makes this an elegant seasonal display for Christmas wreath use or Thanksgiving.. Recommended For Indoor Wreath Use Only. Measures 22 inches across by 5 inches deep.